This section contains excerpts from a work by the architect Robert Lugar (1773 - 1855) entitled: "Plans and Views of Buildings Executed in England and Scotland, in The Castellated and Other Styles", published in 1811. In 1809 Robert Lugar was commissioned by Weddington Castle's then owner, Lionel Place, to redesign the Castle, incorporating the old Hall and making it castellated. The Castle was transformed into a stone-faced building, possibly using Attleborough sandstone, of a similar nature to Arbury Hall. The Plans and Descriptions of Lugar's work on the Castle are replicated here, and provide a fascinating insight into the development of the Castle and a rare glimpse of the interior layout of this building. 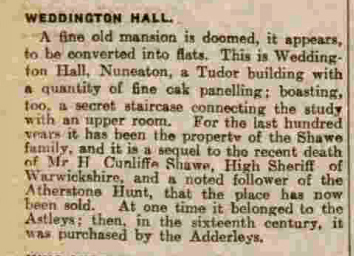 According to a newspaper report lamenting the sale of the Castle for flats in 1922, the Castle also boasted a secret staircase connecting the study to an upper room! You can download a PDF file (2MB) of the above images by clicking here.